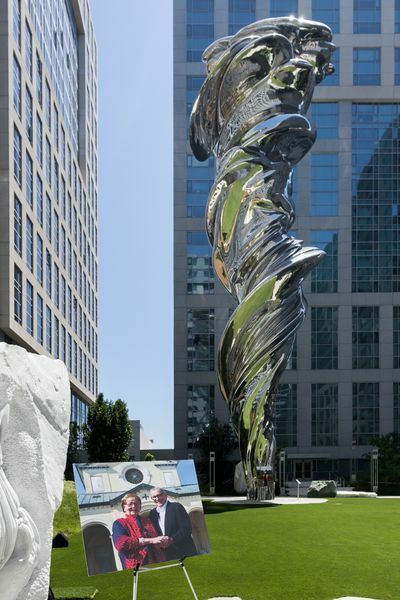 Lawrence Argent, the Denver-based artist behind the swirling, 92-foot-tall statue of Venus now open to the public at Trinity Place (33 Eighth Street), tells Curbed SF that late Trinity landlord Angelo Sangiacomo asked him once if he could make the statue smaller. But only once. 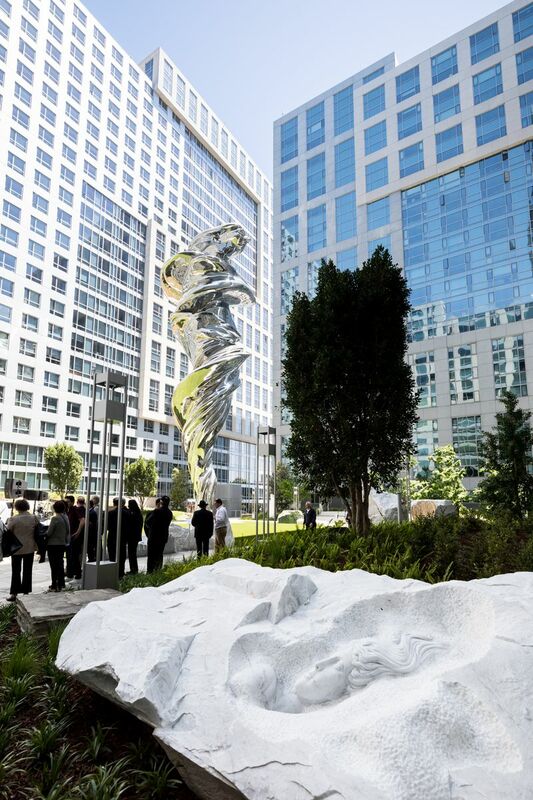 And with that, the towering nine-story contemporary riff on the Venus de Milo became the centerpiece of the Trinity Place public plaza, christened Piazza Angelo at a ceremony on Thursday. 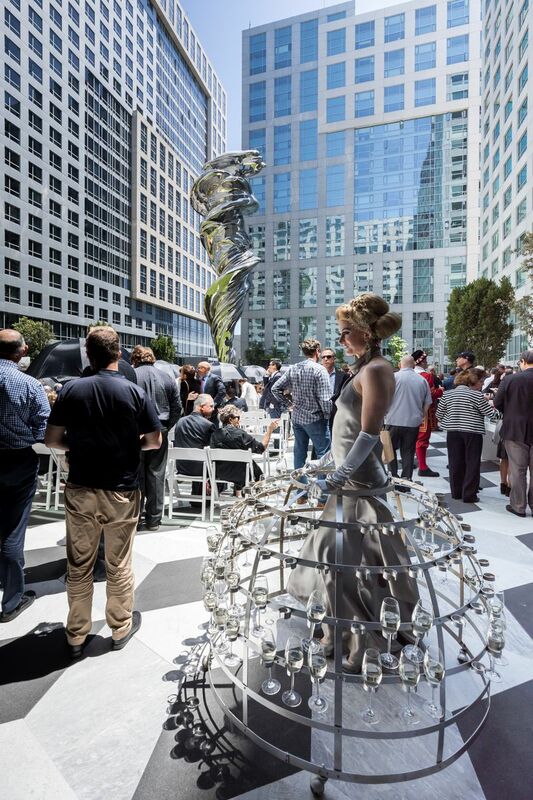 The plaza, finally open to the public, commemorates Sangiacomo, who died in December of 2015. 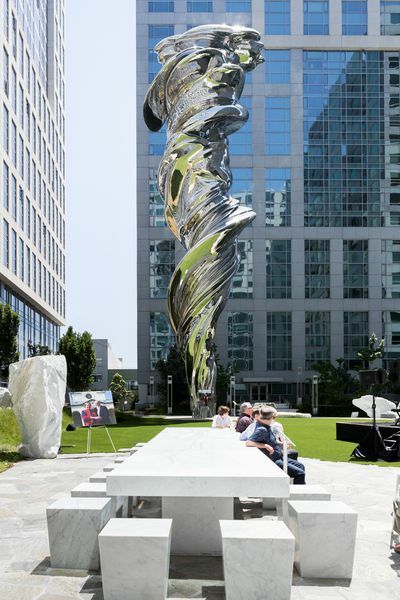 The city wanted Sangiacomo to commit $5 million worth of public art to his development, and he went all in on Venus. The development installed the piece last year but most people couldn’t access it until construction finished on the plaza itself. 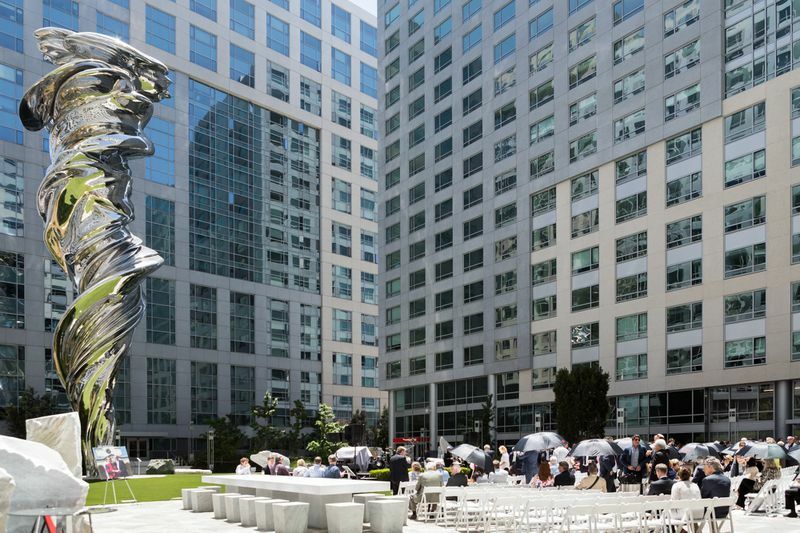 The space around the titanic centerpiece (which, despite its size, is largely concealed from the street, hemmed in by Trinity buildings) includes other elements that pay tribute to classical Mediterranean art and Sangiacomo’s love of things Italian. Note the photo of Sangiacomo and wife Yvonne in the foreground. The table showcases the late landlord’s love of marble. The mosaic floor, massive marble table, and carved figures emerging from boulders like half-excavated relics (one rock bears the likeness of Sangiacomo and his wife Yvonne, signature glasses and all) reflect the late landlord’s personal style of brash, volume-up-to-11 good taste. But obviously the statue steals the show. It will be the biggest piece of art in San Francisco until a taller work by sculptor Roxy Paine, resembling a 110-foot tentacle creeping out of the depths of the tunnel works, goes into the new Yerba Buena subway station in 2019. 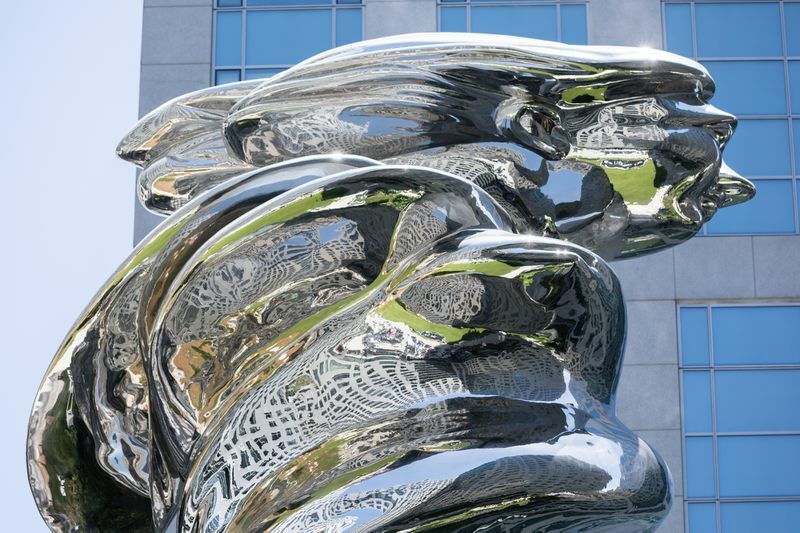 The King Kong-sized figure’s stainless steel skin and contoured lines appear to wrap the surrounding plaza and buildings up in its surface. Argent says he liked the idea of designing something that was huge, but that had a small footprint. Venus’s swirling profile is meant to suggest a figure bursting from the ground, like a liberated geyser. “I wanted it to look as if it’s emerging from the rock—pretending for a second that there’s not a six-story garage underneath us,” he says. Former Mayor Willie Brown predicted that Venus would become a San Francisco landmark on par with the bridges, despite being somewhat hidden. He also noted that the reflective surface should keep the piece pigeon-proof, as the birds’ own reflections spook them. 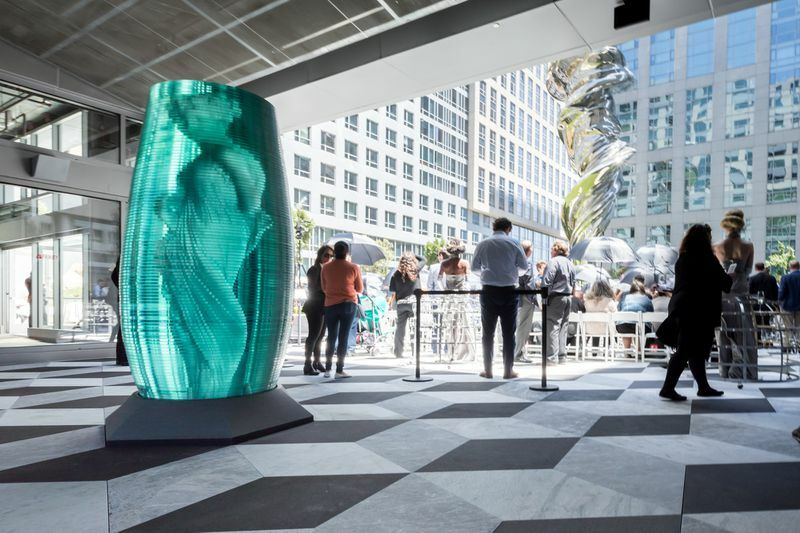 The event closed with 20th-century crooner and former teen heartthrob Frankie Avalon singing his 1959 hit “Venus” to the stainless steel edifice, in a slightly surreal scene. The multipart Trinity Place development broke ground in 2008 but still has one more large building under construction. “I like the interaction between the buildings. Nothing looks separate or alone,” Fort-Brescia said, pointing out how his “interlocking pieces” motif creates the illusion of separate buildings merging into a larger structure. The banks of windows at the base of each building are meant to create the impression that each structure hovers over the ground without touching down. Formerly, Trinity Place was the site of the old Del Webb Hotel. Sangiacomo forged ahead with the redevelopment plan even in the midst of the recession. “If I had it my way, I would have built a huge, tall high-rise there,” he said in 2010.